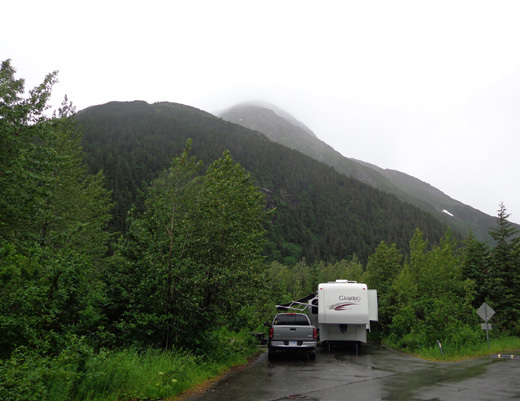 This entry describes the route from our campground near Kasilof to our next destination in Portage Valley, a relatively short distance of 124 "camper miles" that were mostly through beautiful mountain valleys on the Kenai Peninsula. 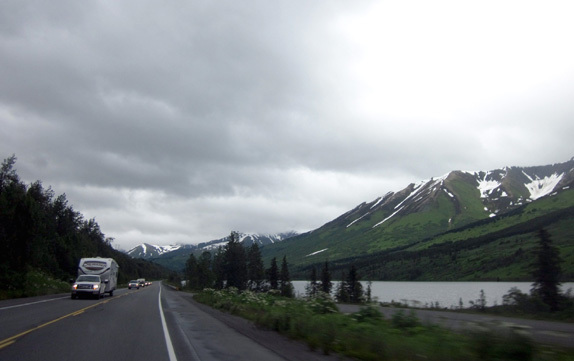 As usual, my trip notes are presented from the perspective of an RVer but much of the information is relevant to travel in passenger vehicles or even tour buses. 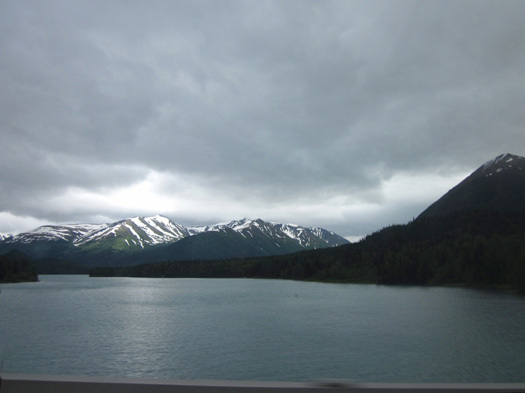 When we crossed the Placer River just south of Portage we officially left the Kenai Peninsula behind us. Now we are at the far end of Turnagain Arm and back in familiar territory. We were here on June 27 but, my, it seems like so much longer ago! Some days we do so many things that they seem like two or three days each. We left the Kasilof campground at 10 AM. 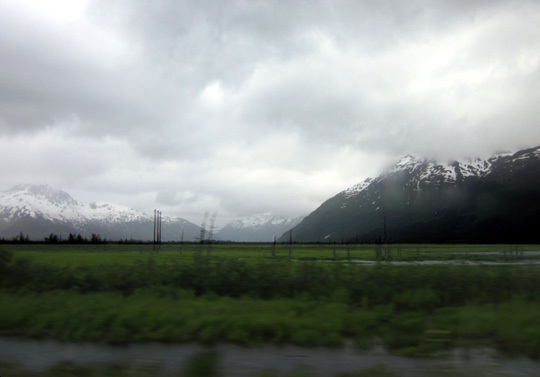 Intermittent rain -- the reason we decided to leave the Peninsula a few days early and return to Anchorage -- was our constant companion today and only got worse in the Portage Valley after we arrived about 12:45 PM. We tried to enjoy the scenery anyway. 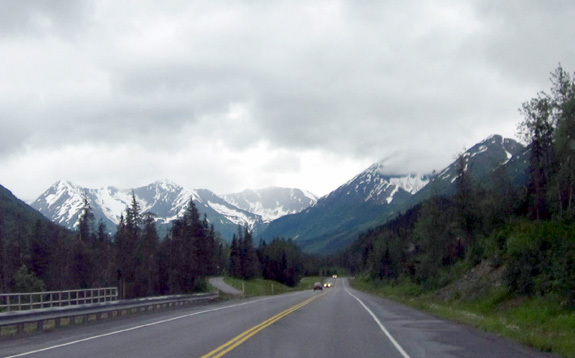 This is a beautiful drive even on a rainy summer day and would be spectacular on a sunny summer day. Maybe the next time we visit the Peninsula it'll be more sunny. 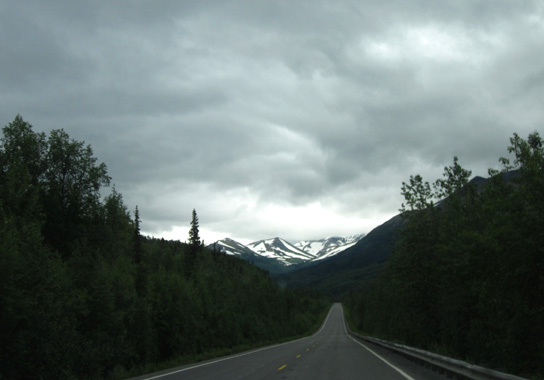 Heading east on the Sterling Hwy. 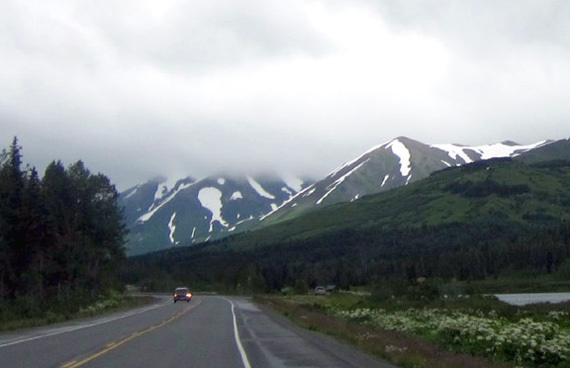 The only stop we made en route to the Portage Valley was to get fuel at a Holiday service station in Soldotna ($4.39/gallon, the going rate there for diesel). The nearby Fred Meyer parking area was packed with RVs, which are allowed to stay free for up to three days in a certain area. We talked with a couple, Nancy and Wes, at Williwaw Campground who were there last night. They said the Fred Meyer store is similar to a super Walmart inside. 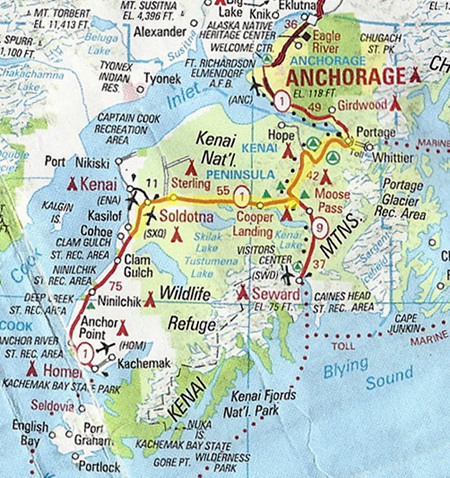 I barely consulted The Milepost book or maps on the way to Portage Valley since we�ve covered this route before, mostly going the other direction. Unfortunately, it was raining most of the time then, too! Because of the rain I didn�t take very many photos and most of those were poor from inside the truck as we were moving. I didn't even try to PhotoShop the gloom away! WYSIWYG. Most of the time we could see the tops of the peaks; it could have been worse. 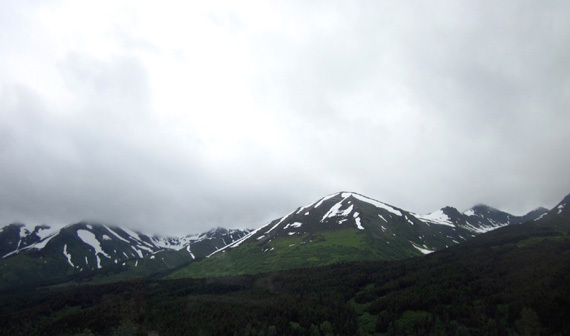 When we got into the Portage Valley we could see the lower part of several of the "hanging" glaciers. 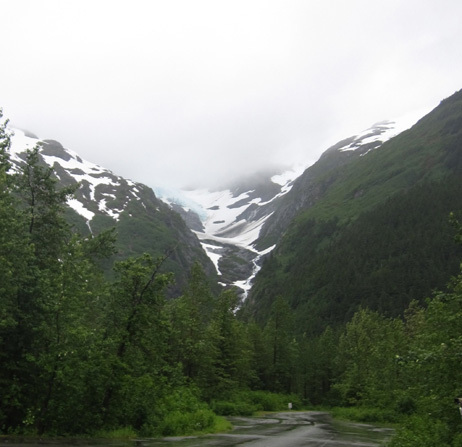 That's one of several hanging glaciers along the road through Portage Valley. 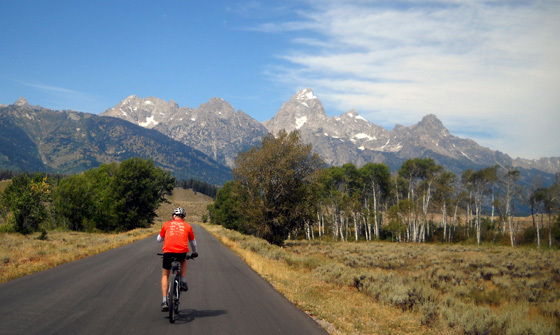 Folks who hike and bike the Trail of Blue Ice bike path can see them better than they can be seen from the road. Traffic was moderately heavy this morning going in our direction on the Sterling Hwy. from Kasilof to Tern Junction. It's even busier that direction on Sunday afternoons and evenings because many Anchorage residents are returning home after the weekend or a week of fishing down on the Peninsula. Remember all those dip net salmon fishermen I talked about in an earlier entry? The majority are reportedly from the Anchorage area, where over half of the people in Alaska live. 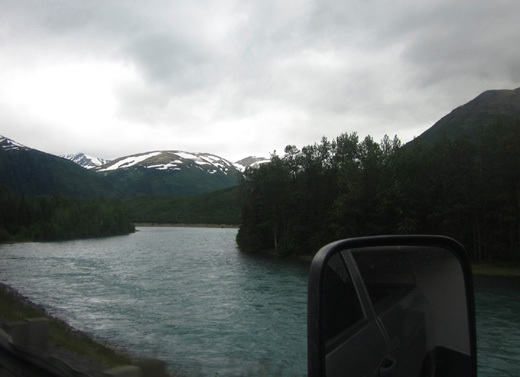 Kenai River along the Sterling Hwy. 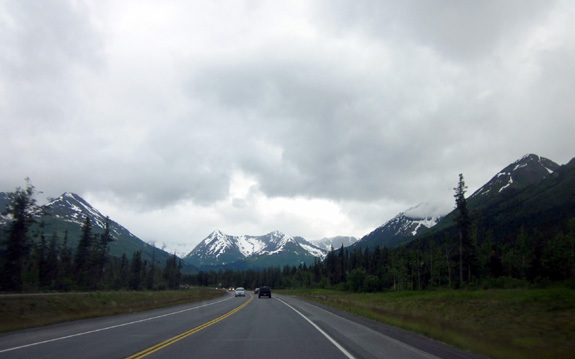 Traffic was predictably heavier going northbound on the Seward Highway from Tern Junction to Portage Valley but there are more passing lanes on that road so faster vehicles didn't get piled up behind slower ones for long. The surface was good and for most of this section the speed limit is 65 MPH. The mountains and valleys were very pretty the entire way. There were more Indian paintbrush and fireweed blooms than two weeks ago when we went south on that section to Russian River but I didn't get any good pictures of them. 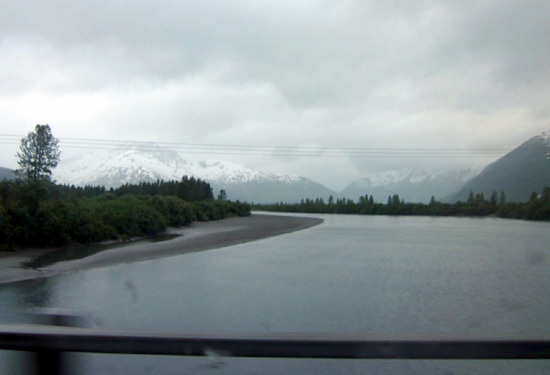 The rain got a little heavier as we approached Portage Valley, just after crossing the Placer River (above). We turned east on the highway that goes through the valley to the coastal town of Whittier and drove about four miles to the Williwaw USFS Campground. We�ll probably be here just one night since it�s predicted to continue raining tomorrow. We had hoped to visit the old gold mining town of Hope and see the Crow Creek Mine at Girdwood on day trips while camped here. If it stops raining we might stay another night or two. If not, we'll leave tomorrow for Anchorage. I love everything about this campground! In the next entry I'll describe it and the fun we had nearby this afternoon and evening -- despite the rain.